The Feed the Future Innovation Lab for Peanut works in countries where peanuts are an important source of food security, cash revenue and agricultural diversity. 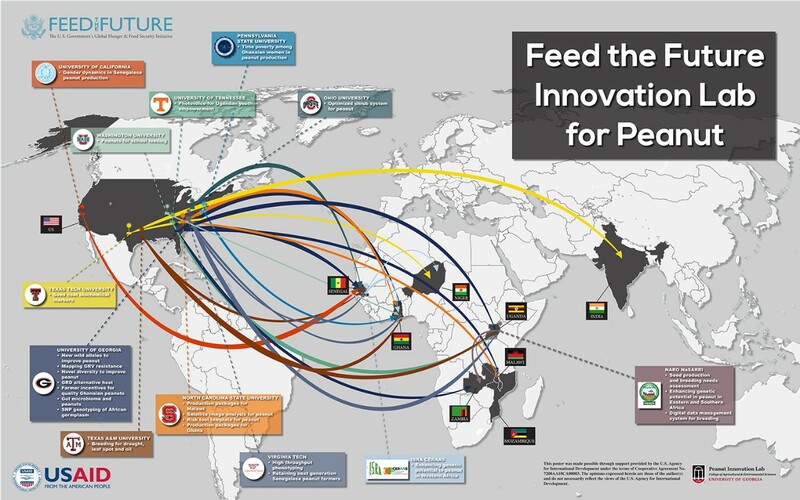 While the Peanut Innovation Lab doesn't yet have a list of locations, Feed the Future has several target countries, including Bangladesh, Ethiopia, Ghana, Guatemala, Honduras, Mali, Kenya, Nepal, Nigeria, Niger, Senegal and Uganda. The Peanut Lab will work in at least some of these places. The innovation lab's primary countries of focus are Senegal, Mali, Ghana, Niger, Nigeria Ethiopia, and Uganda. Secondary focus countries include Malawi, Mozambique, Zambia and Haiti. Partners and collaborators may also be based in other countries strategically connected to focus countries.